PHILADELPHIA (09/15/13) For the second straight week, the San Diego Chargers (1-1) saw their fate decided by a field goal during the last seconds of the game. Only this time it was a 46-yarder by kicker Nick Novak with 7 seconds left that secured their first win of the season at Lincoln Financial Field. Michael Vick led the Philadelphia Eagles' (1-1) high-octane offense throwing for a career-high 428 yards and two touchdowns, but their defense had no answers for the Chargers' passing attack. Phillip Rivers completed 36 of 47 passes for 419 yards and three touchdowns to Eddie Royal. 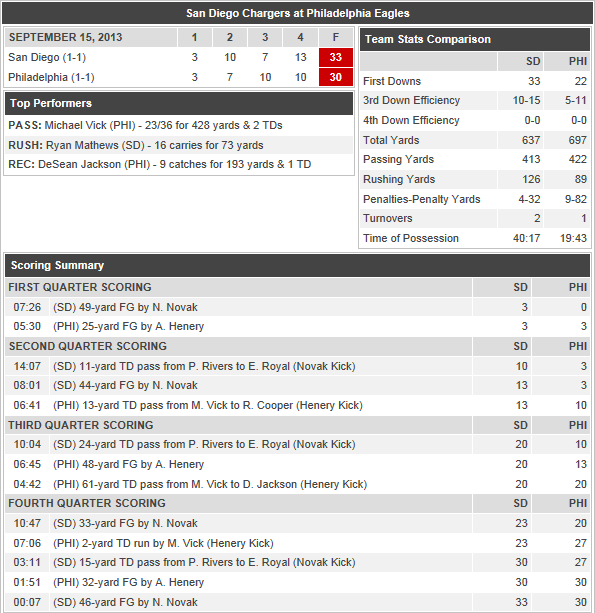 The Chargers were only forced to punt once, but gave up two fumbles inside the Eagles' 10-yard line in the first half. Defense was nearly non-existent in this game as both offenses combined for 1,150 total yards. Each team recorded just one sack and no interceptions were thrown. 36/47 for 419 yards and three touchdowns. Eight catches for 124 yards. Five catches for 102 yards prior to leaving the game with a neck injury early in the second half. Seven catches for 90 yards and three touchdowns. 23/36 for 428 yards (career-high) and three touchdowns, one rushing TD. Nine catches for 193 yards and one touchdown. Five catches for 114 yards (career-high), 53 rushing yards. The Chargers will hit the road again on September 22nd to take on the Tennessee Titans (0-2) who are coming off a 30-24 loss to the Houston Texans (2-0) in overtime.